Champlevé is a beautiful technique used in enameling where you create recessed compartments or cells, in metal to receive enamels. These recessions can be achieved several ways. One, remove metal by graving out an area using gravers or chisels, in any metal of enameling. A second option of Champlevé is the use acid, which has been popular in the past few years. ferric nitrate works on copper, sulfuric acid on fine silver or sterling silver, to achieve a cell to enamel in. Second. etch out you place a resist on the areas you do not want the acid to removed such as asphaltum varnish, applied with a paint brush. Now you are ready to float the jewel in the acid. It is rather slow maybe 24 hours to remove the desired depth of metal. And third, to create Champlevé is to fuse or solder plates of fine silver or sterling silver. The top plate can be saw priced out and laid over the solid bottom plate. Engraving takes some time to learn and the acids are a nice thing to avoid. My choice is to create a jewel in the champleve technique using two plates of metal one for the bottom or foundation and one for the top to create an edge. The easiest metal in my opinion is fine silver. And fuse them together. This process is also used in granulation buy adding copper to one of the sheets of metal. Here is a simple demo. The ring will act as a stop for the enamels, also creating the recession or cell to create champleve. In the first image one part of the fine silver is plated with copper. The second image shows the pieces of fine silver fused together. You can use a torch or kiln. The third image here I have soldered on a bail with hard sliver solder. And after graving out the background to add some sparkle , I laid in two thin layers of enamel, and polished. Champlevé and enameling jewelry technique. 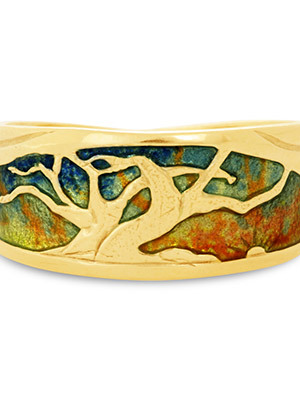 This Champleve ring I removed the background of the ring with a graver, chased the tree in and enameled the recession. I’m a self-taught beginner and I’ve found your blog very helpful; thanks for putting it together especially sharing your answers to questions. I just want to try my first champlevé and the blue fuse recommended for fusing fine silver is not available in the UK. What do you mean by plated with copper above? Is the copper coloured metal above fine silver or copper? Will the copper not interfere with fine silver? I have to say here that I’m not a metalsmith either. In the images you can see one part of the jewel is plated with copper. To do this you need to make a copper solution. I put scrap copper in a slow cooker. And pickle and water. The pickle solution you use to clean your metal after soldering. Let the copper simmer till the solution turns blue. Remove it from the slow cooker and save in a glass jar. This takes several weeks. This is now the blue plating solution. Place one part of your jewel in a small amount of blue solution. Some call this “spent pickle”. Add iron wire and the fine silver, it will turn a copper color. Now it is plated with copper. Just takes a few second. The iron wire needs to touch the fine silver to make it plate. Be sure to rinse well. Then you can use a torch to heat all the parts and they fuse together. Thanks very much for the very speedy response. I’ll try copper plating as soon as I get home as well as fuse little scraps of fine silver.